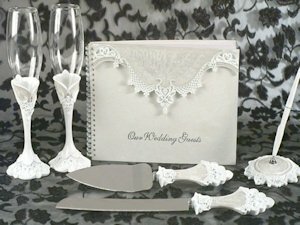 Bring the grace and elegance of your wedding day to your reception with this classy set of reception essentials. 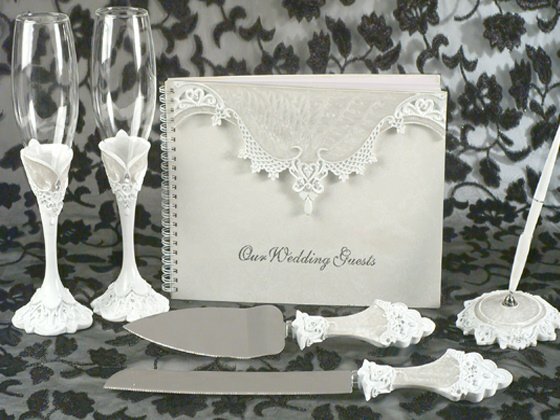 The Elegant Lace set includes a 8 x 10 guest book, pen set, cake knife and serving set and 2 toasting flutes. Each item is made of durable poly resin accented with lovely scalloped edge lace like designs and perfectly placed crystals. Each piece comes individually gift boxed.